Whether meat, seafood, vegetables, fruits, etc. All food is more than a source of energy. It is a blessing from the Lord. When Scripture talks about food it’s not always talking about the physical. Sometimes it is talking about the spiritual and the spiritual food is something that most people neglect and that is why many are not healthy. God has given both believers and unbelievers food to eat. 2. Genesis 9:3 Every living creature will be food for you; as I gave the green plants, I have given you everything. 3. Genesis 1:29 God said, “I have given you every plant with seeds on the face of the earth and every tree that has fruit with seeds. This will be your food. God provides food to all of His creation. 4. Genesis 1:30 And to all the beasts of the earth and all the birds in the sky and all the creatures that move along the ground–everything that has the breath of life in it–I give every green plant for food.” And it was so. 5. Psalm 145:15 The eyes of all look to you, and you give them their food at the proper time. 6. Psalm 136:25 He gives food to every creature. His love endures forever. Food was used as a blessing by the Lord. Some people eat their plate of food, but are still starving. They are starving spiritually. With Jesus you will never hunger and thirst. Our next breath comes from Christ. We are able to enjoy meals because of Christ. Salvation is only found in Christ. It’s all about Him, He is all that you need, and He is all that you have. 9. John 6:35 Then Jesus declared, “I am the bread of life. Whoever comes to me will never go hungry, and whoever believes in me will never be thirsty. There is a food that nourishes us unlike physical food that is only found in the Word of God. Some people have nothing. Some people are eating mud pies. We must always be thankful for the food that the Lord has provided us with. No matter what it is. 14. 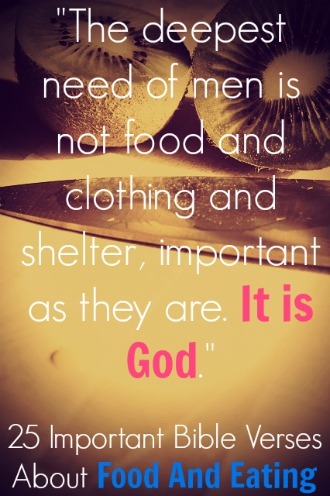 1 Timothy 6:8 But if we have food and clothing, we will be content with that. Try to glorify God in every way. Do this by drinking water and giving thanks. Do this by giving food to the needy. Do this by inviting people over to eat. Give God all the glory. 15. 1 Corinthians 10:31 So whether you eat or drink, or whatever you do, do it all for the glory of God. Can Christians eat pork? Can Christians eat shrimp? Can Christians eat shellfish? We have all heard these questions and the answer is all food is permissible. 16. Romans 14:20 Do not destroy the work of God for the sake of food. All food is clean, but it is wrong for a person to eat anything that causes someone else to stumble. 17. 1 Corinthians 8:8 But food does not bring us near to God; we are no worse if we do not eat, and no better if we do. We shouldn’t call anything unclean that God has made clean. 19. 1 Corinthians 10:25 So you may eat any meat that is sold in the marketplace without raising questions of conscience. Jesus fulfilled the laws regarding impure food. 21. Romans 10:4 For Christ is the end of the law for righteousness to everyone who believes. What Scripture worries about is the amount of food we eat. Gluttony is a sin. If you can’t control your appetite you will not be able to control anything else. 22. Proverbs 23:2 and put a knife to your throat if you are given to gluttony. 23. Proverbs 25:16 Hast thou found honey? eat so much as is sufficient for thee, lest thou be filled therewith, and vomit it. 24. Proverbs 25:27 It is not good to eat too much honey, nor is it honorable to search out matters that are too deep. God will always provide food for you. Sometimes we worry so much and God is just trying to calm us down and tell us to put our mind on Him. Trust in Him. He will never fail you. 25. Matthew 6:25 “For this reason I say to you, do not be worried about your life, as to what you will eat or what you will drink; nor for your body, as to what you will put on. Is not life more than food, and the body more than clothing? Bonus: Jesus was never empty. Why you ask? He was never empty because He was always doing the will of His Father. Let’s imitate Him. John 4:32-34 But he said to them, “I have food to eat that you know nothing about.” Then his disciples said to each other, “Could someone have brought him food?” “My food,” said Jesus, “is to do the will of him who sent me and to finish his work. Next: How To Have A Clear Mind?